Today’s meal was quite hearty as I trained in a fasted state this morning. I hadn’t eaten anything for close to 16 hours but I must say I wasn’t ravenously hungry, all the same I made sure that I slightly overfed myself. The meal comprised of some elements left over from a couple of previous meals as well as some slow-cooked buffalo mince casserole that I had cooked overnight. The casserole was made using some beautiful grass-fed minced buffalo, bought from Laverstok Park farm, some vegetables (onions, garlic, swede, carrot and kale) as well as some home made lamb stock that had been sitting in the freezer for a while. I also added a little seasoning, a dried-herd bouquet garni & some tomato puree to thicken the sauce. 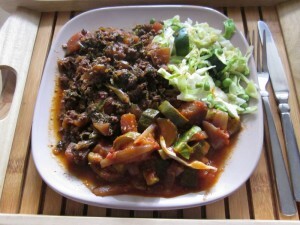 To finish the meal off I added some left-over steamed cabbage, peas & courgette alongside some homemade ratatouille (onion, garlic, aubergine, courgette & tomato). I usually add chili to most of my meals but I don’t think it would’ve worked with a root vegetable casserole so I’m glad I left it out. The kale was beautifully wilted after the 6 hour slow cook & the swede had become soft, translucent & slightly sweet in flavour. If I had to change one thing I would put fewer vegetables in the casserole, as I had two vegetable only accompaniments I don’t think it was necessary, but as a standalone meal it would be perfect.